Did you know you can now order your Deliveroo takeaway from La Pizzica here on View? La Pizzica is an Italian bar and cafe located on Fulham Road. Do you work at La Pizzica? What did you think of La Pizzica? I have been to this place before, but the experience on this occasssion was not great, me and my mum ordered starter £12.00 which was described as selection of traditional plates. We got a plate of cold chicken strips with cold green beans, a plate with 4 mussels, a plate of cooked beans i.e kidney beans, chick peas etc.. Which was all ok... But then there was a plate of meat in an oily sauce which as soon as you attempted to eat it you could see the meat was rancid/ starting to go off. Flys kept circling the plates. I asked the waitress if this smell was normal when she came to clear the plates, she went to the kitchen but didnt give me an explanation. The mains arrived I ordered spaghetti, which was flavoursome and cooked well. But when I got to the bottom of the plate there was a pool of oil, which I know is not normal. My mums dish was again cooked well but the meat balls were clearly frozen and from a packet, very dissapointing. La pizzica deli which is down the road is 10 times better and cheaper. Would not recommend this place at all. Im married to an Italian, who is from the same region as the cuisine served at La Pizzica. So I can say that unfortunately its a poor imitation of the genuine thing. 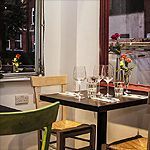 The deli has long been established as one of the best Italian venues in London but the new restaurant further along Fulham Road is a sensation. Fabulous atmosphere, food, wine and incredible value. A fantastic night out - grab the big round table for a party of 8 or so. Is not a restaurant is not a bar!!! La pizzica...!!! You can eat typical Italian food , drink good wine and enjoy the brilliant and happy atmosphere!!! Specially in the "noisy" aperitif!!! I just love it !!! Happy place!!! This review couldn't be further from the truth. It is a tyipcal, informal, cosey, local Italian cafe, that serves excellent apperitivo in a friendly environment. It's "Noisy" because it's so popular that there are often a lot of people chatting/celebrating/enjoying themselves. "small" - yes, but in a way that it's personal. "Hot" - take off your jumper. "Italian" shop masquerading as a bar - obviously the previous reviews were written by the owners. Noisy, too small & hot, uncomfortable atmosphere. Not a restaurant, absolutely not worth making the effort to get to. great place! aperitifs are great fun and really good value 4 money! a little piece of italy in southwest london! Aperitifs are just fantastici and the atmosphere is bellissima! This place is amazing, great food and even better atmosphere, especially their aperitifs- Wed, Fri and Sat night. I'm going there as often as I can, as the place gives you great italian feeling.